Parabola cantilever walkway delivers park visitors to the brink. Concerned that visitors to Canada's national parks were becoming increasingly disengaged from both the experience of the outdoors and the reality of climate change, Parks Canada launched a search for private-sector initiatives to reverse the trend toward drive-through tourism. Brewster Travel Canada answered the call with a limited design competition for a walkable structure in Jasper National Park's Sunwapta Valley. "One of the bus drivers suggested that we do something over this particular gorge, Trickle Creek Canyon—something that could be suspended off the side of the mountain that brought visitors into a more intimate relationship with the Athabasca Glacier and its melting," explained Sturgess Architecture principal Jeremy Sturgess. With design-build team lead PCL Construction Management and structural engineer Read Jones Christoffersen (RJC), Sturgess' firm crafted a cantilevered walkway that, clad in weathering steel and glass, defers to its natural surroundings while providing breathtaking views of the glacier and valley floor. Though not a facade itself, Glacier Skywalk warrants discussion within the context of high-performance building envelopes for its innovative structure and streamlined approach to materials—the "+" in Facades+. Though the expected solution to the competition brief was a suspension bridge or other high-masted element, "we thought as a team that this approach would not be appropriate to the site," recalled Sturgess. "As much as we were going to make something courageous and heroic, we also wanted it to be subtle." RJC's Simon Brown came up with the idea of a parabola cantilever that draws visitors 35 meters beyond the face of the cliff. Sturgess Architecture focused on minimizing the material palette, relying primarily on Corten and glass, plus gabion mats filled with local rocks and concrete on the adjoining interpretive walk. "The idea was that the Corten would emulate the ferric oxide outcropping that you see on the existing mountainside," said Sturgess. 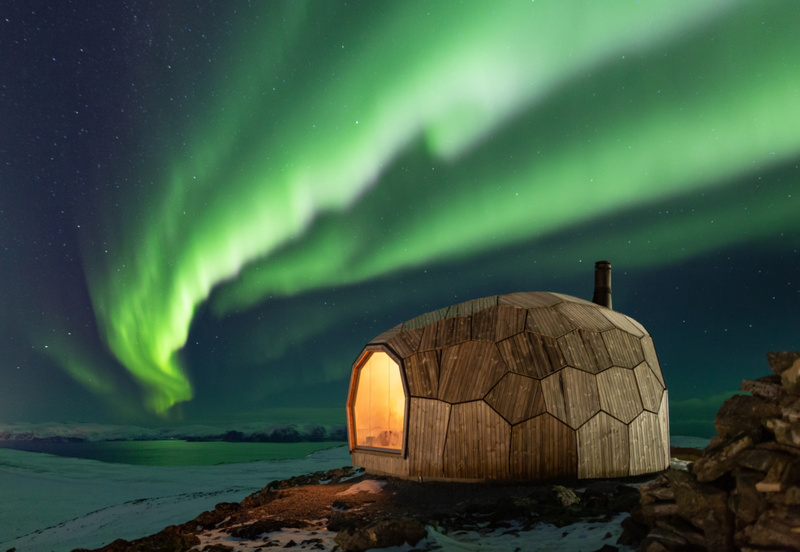 "We wanted the whole element to feel fractal and extruded from the mountainside. As much as it was clearly manmade, it was to be as sensitive to the local environment as possible." 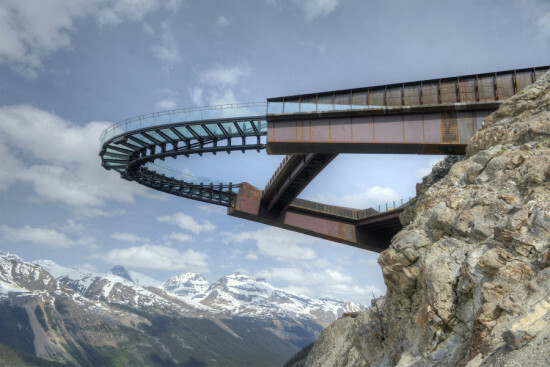 Glacier Skywalk's signature design element is its glass floor, constructed in three layers—two structural, the third designed to be easily replaced if broken or otherwise damaged. "I'm a little nervous about walking on glass floors," admitted Sturgess. Several times he suggested replacing the glass with an opaque material to save money, but the rest of the team refused to let go. "Normally when I've worked in design-build, the gun is to our head and the finger's on the trigger," said Sturgess. "In this case, every time we suggested, 'We can save money here,' everyone on the design team was so in love with the concept, we couldn't lose anything lightly." Sturgess Architecture swapped Rhino models with PCL, RJC, and Heavy Industries, who formed all of the Corten work, throughout the design development phase. "I've never gone through such an extraordinary hands-on design process working with the actual craftsman of the solution," said Sturgess. "This iterative process of working with the team as we crafted every piece kind of by hand—though on the computer—is what led to the success of the project." In combination with its geologically inspired cladding, Glacier Skywalk's minimal structure delivers an illusion of weightlessness that only adds to the sense of exposure. The curvature of the walkway allowed RJC to install a nearly invisible cable suspension system to counterbalance its outward propulsion. "It expresses the thrust from the mountainside, and it does it in a way that makes it feel like a really integral fit with the [landscape]," said Sturgess. "The success is that it's not too much." Illuminated steel pavilions mimic Chinese peaks. The hillside site of Fengming Mountain Park, in Chongqing, China, presented Martha Schwartz Partners with both a practical challenge and a source of inspiration. 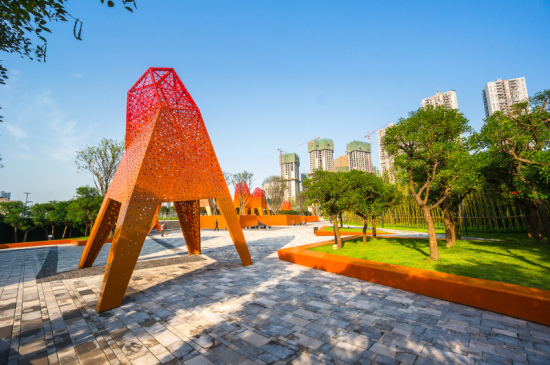 Asked by Chinese developer Vanke to design a park adjacent to the sales office for a new housing development, the landscape architecture and urban planning firm quickly gravitated toward the metaphor of a mountain journey. "That's why in the plans you see a zig zag pattern" to the path leading down to the sales center from the car park, said associate Ignacio López Busón. Steel pavilions scattered along the walkway pick up on the theme, taking the form of abstracted mountain peaks. "That's something the client really liked," said López Busón. "Once the idea was clear, it was all about developing the shape of them, and trying to make them look special." To refine the image of the pavilions, explained López Busón, "we first looked at the faceted nature of Chinese mountains. They aren't smooth at all." Fengming Mountain Park's metal structures feature an aggressive geometry that twists and turns above chunky legs. The pavilions' perforations and red and orange color scheme were inspired by a second cultural touchstone. "Martha was interested in the idea of the Chinese lantern," said López Busón. "The lanterns are red; then you put a light inside, and they become a nice gradient of red and yellow." The Fengming Mountain Park team started work on the pavilions with hand sketches, then brought the concept design into Rhino. There they played with the shape, developing a system of triangular modules that again represented mountain peaks. Then they transferred the model to Grasshopper, where they focused on the perforations and color. "We made paper models, but not too many because we were quite happy with the result in Rhino," said López Busón, who acknowledged that a compressed schedule was also a factor. The most difficult aspect of fabrication, said López Busón, was adjusting the design of the pavilions to fit the size of the laser beds to which Third Chongqing Construction Engineering had access. 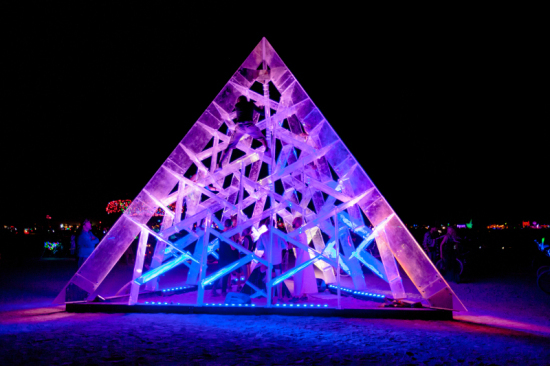 "We made a Grasshopper definition to guarantee that every triangle fit the laser bed. However, the final outcome showed several scars, which tells us that the developer likely reused some leftovers to save on materials." Both the panels and the supporting profile tubes were fabricated out of steel, to reduce costs. Martha Schwartz Partners originally proposed painting individual panels after cutting, then assembling the finished panels on site. "The fabricators didn't agree," said López Busón. "They built the pavilions first, then spray painted them." The result, he said, was favorable. "What you see is a smooth gradient from the bottom to the top." The perforations, too, help negotiate the transition from ground to sky. "We came up with a pattern that changes from bottom to top, which sort of dissolves the pavilion," said López Busón. "It's quite nice at night. 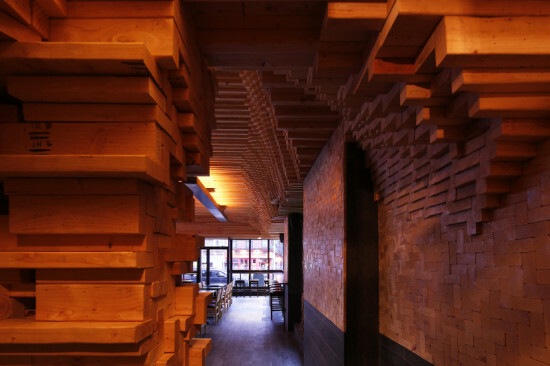 There's also this nice merging between decoration and structure; you can't tell what is what." The experience of designing a 16,000 square meter park on an abbreviated timeline "was intense, but fun," said López Busón. "At the very beginning, we were following this traditional way of practicing architecture: Whatever we designed in three dimensions, we unrolled and put into AutoCAD." But as the weeks flew by, the designers streamlined the process, sending 3D models directly to the client—a process, he explained, that allowed the designers to catch and immediately correct a problem with the perforation pattern. "Without the digital tools, it would have been impossible." Owner-built interior explores the transition from two dimensions to three. For his latest venture, The Montrose in Park Slope, Brooklyn, whisky bar proprietor and former contractor Steve Owen (with partners Michael Ferrie and Alex Wade) wanted a rough, industrial look evocative of an Old World distillery. "He was coming at it sort of from an antique perspective, as a pastiche," said B. Alex Miller, partner at Taylor and Miller Architecture and Design. "We were thinking of it in a different way." 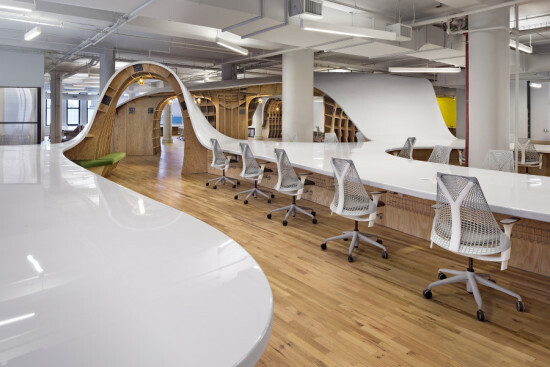 Taylor and Miller, who had worked with Owen on several projects when he was a practicing contractor, noticed the prevalence of wood herringbone patterning on the walls and floors of the spaces Owen was inspired by. "We'd done some other herringbone studies," said Miller. "We said, 'This is something that's often done in a high-end scenario. Let's pare it down to the barest of essentials, just do it out of 2-by-4 pine, do it in grain on the walls.'" The design of The Montrose became, said Miller, "a very basic exercise in transitioning from a two-dimensional to a three-dimension pattern," in which individual boards were pulled away from the wall in the z direction. Working in Rhino, the architects explored multiple iterations of the form, including the different textures created when a unit was defined as a single stick versus a two-board L. The ceiling, along which boards are arrayed lengthwise, also received a three-dimensional treatment. "There were some really interesting relationships in the ceiling," observed Miller, "almost like a musical score." Though the herringbone patterning was developed almost entirely on the computer, Taylor and Miller wanted to avoid the sense of an overly precise, machine-made space—hence the use of standard lumber. "We're often looking at very basic materials, at how to do it in a repetitive way so that the human intervention is felt," said Miller. "We wanted to make it a little more than a highly fabricated, laser-cut, pristine sort of thing." Owen built The Montrose's interior himself. "Because he was a friend, and a contractor, we could remove a lot of the documentation that would normally be required," said Miller. In fact, Owen soon abandoned the digital models Taylor and Miller passed along. "Once he figured out the system, we were able to give him just data points, just coordinates," said Miller. "It was a feedback loop: he was interpreting what we gave him. He said, 'Okay, just give me the z data off the wall.' We joked that he was seeing the Matrix a little bit." The installation itself was "dumb, in a good way," said Miller, requiring nothing more than nails and the occasional screw. "When we're doing something like this that we know is hyper-labor-intensive, it can't be complicated from an install point of view. There's nothing overly polished; it's just dirty." That messiness is exactly what Miller most appreciates about the finished product. "When we go in there now, some of the curves are a little bit rough," he said. "You can see these—they're mistakes, frankly, but I love the space because of it. This is not a highly precious thing, this is not a highly sculptured piece. It's someone interpreting our concept." Folded aluminum panels deliver the illusion of movement to passersby. 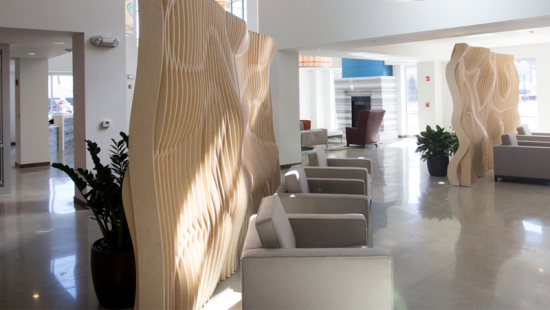 During their recent expansion, Eskenazi Hospital in Indianapolis approached Urbana Studio with an unusual request. The hospital wanted the Los Angeles-based art and architecture firm to design an interactive facade for a recently completed parking structure. "With Indianapolis' really extreme weather patterns, we gave a lot of thought to: how can we make something that's interactive but won't be broken in a year?" said Urbana principal Rob Ley. "Unfortunately, the history of kinetic facades teaches us that that they can become a maintenance nightmare." Urbana's solution was to turn the relationship between movement and the object on its head. Though the aluminum facade, titled May September, is itself static, it appears to morph and change color as the viewer walks or drives by. 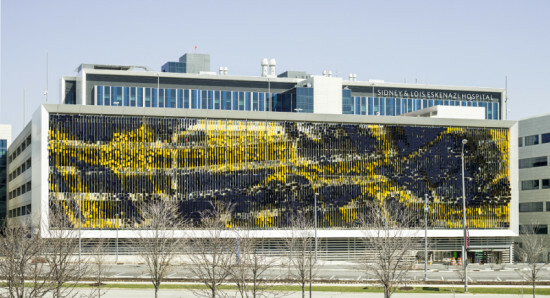 May September—a semi-transparent rectangular wall comprising 7,000 angled aluminum panels—was inspired in part by Ley's interest in camouflage, and specifically active camouflage. "I wanted to take that on more in a passive way than an active way," he said. The designers set out to create something like a lenticular image, which seems to shift or jump into three dimensions as the angle of view changes. "Could we make something where the pieces themselves don't move, but we recognize that the people in front of it will be moving?" asked Ley. Urbana Studio dedicated six months to the design before sending it to fabrication. The first half of the work was digital, primarily using Rhino and Grasshopper as well as software the designers wrote themselves in Processing. The team spent a lot of time on color. "The idea was to find two colors that would have a good contrast, and that maybe don't exist at all in Indianapolis," said Ley. The final scheme, which pairs deep blue with golden yellow, drew on the work of local landscape artist T.C. Steele. After building renderings and animations on the computer, the firm constructed mockups to check their assumptions. The unique site conditions influenced both the choice of material—aluminum—and the placement of the panels. "It had to be very lightweight, because it was going on a structure that wasn't engineered to have anything like this on it," said Ley. The designers also had to contend with the natural movement of the garage, and wind gusts up to 90 miles per hour. "It doesn't seem that interesting, but when the entire project is basically making sails, the wind issue is counterintuitive to what you're doing," said Ley. Indianapolis Fabrications fabricated and installed the facade. "We'd worked to pare the design down to be very modular, so there would be no waste materials," said Ley. "We also worked out a system that would look like there's an infinite number of variations of angles, but in the end there are only three. We're faking a lot of variability with a system that doesn't have that many possibilities." Urbana Studio also designed a custom aluminum extrusion so that the bolts—three per panel, or 21,000 in total—could slide into the facade's vertical structural elements without the use of a drill. "It allowed us to have this very erratic placement of elements without having thousands of holes to verify," explained Ley. Indianapolis Fabrications assembled the facade off site in 10 by 26 foot sections. The size of the pieces was dictated by factors including the width of the street, the overhang on the existing structure, and the wind resistance each component would face as it was lifted into place. Ley was pleasantly surprised by the interest May September generated among other would-be garage designers. "There are a lot of parking garages out there," he said. "Usually they're very much an appliance. As an archetype, the parking structure is not very interesting, but everyone's anticipating that they're not going away." As for his own firm, Ley would welcome another commission for a parking structure—particularly one that allowed him to work from the ground up. "I enjoyed dealing with a window treatment," he said. "But it would be nice to be involved earlier on, to be able to pursue it in a more holistic way." Carbon fiber’s unique properties would seem to make it an ideal building product. Untreated, carbon fiber cloth is flexible and easy to cut. After an epoxy cure, it is as hard as steel. But while the automobile and aerospace industries have made widespread use of the material, it has gone virtually untouched by the architectural profession. 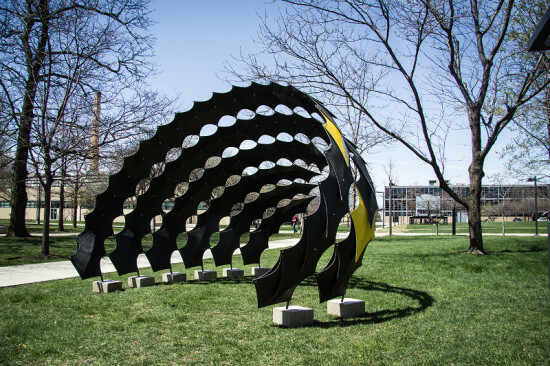 Alphonso Peluso and his undergraduate students at the IIT College of Architecture set out to change that with their FIBERwave PAVILION, a parametric, sea life-inspired installation built entirely of carbon fiber. "We want to make the studio an expert resource for people trying to get into carbon fiber in terms of architecture," said Peluso, whose students designed, funded, and built the pavilion this spring. "There’s a studio in Germany that’s in their second year of working with carbon fiber, but I don’t think anyone in the United States is working with it." Peluso’s studio began with an internal competition. Because the spring semester course followed a class dedicated to the exploration of various composite materials, many of the students were already familiar with the pros and cons of carbon fiber. "Toward the end of the first semester we started working with carbon fiber, and it wasn’t the greatest result," said Peluso. "But we knew we had to keep working with it. That played a big part in the selection of the design for the second semester." The students judged the submissions on constructability as well as aesthetics, he explained. "It was interesting to see the students as the pavilions were being presented, see their minds turning on: ‘Okay, this one is feasible—this is one we can actually build.’ Sometimes the design was a little better, but the overall project seemed less possible within the time frame." The winning design is based on a bivalve shell structure. The student who came up with the idea used parametric design software to explore tessellations of the single shell form. "What I was pushing them to do in the first semester was large surfaces that weren’t repetitive," said Peluso. "In the second semester, it was like they intuitively knew there had to be repetition of the unit." As a group, the class further developed the design in Rhino and Grasshopper. 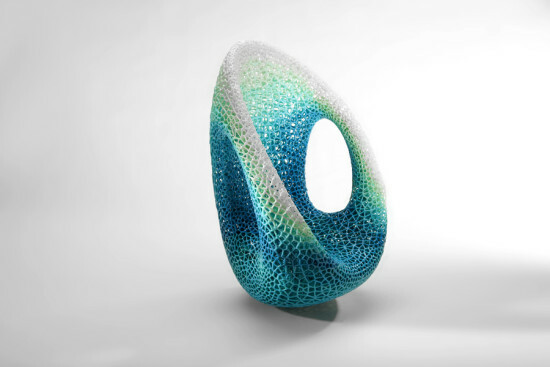 But while the students used parametric software to generate the shell pattern, in general FIBERwave PAVILION was "less about designing in the computer," said Peluso. "Most of it was fabrication based." The studio was hands-on from the beginning, when students were asked to submit a small-scale carbon fiber with their competition entries. They went back to Rhino to make the molds. "We had to make six molds," explained Peluso. "Even though it was one identical shell unit we had to produce 86 of these shells. When you make a composite unit, if you have one mold you can only make one shell per day." In the end, the students fabricated a total of 90 shells (including several extra to make up for any defects) over the course of about four weeks. "The actual assembly was pretty quick, the pavilion itself went together in less than a day," said Peluso. Laterally, bolts through CNC-drilled holes connect the shells at two points on either side. The overlapping rows of shells are secured vertically through bolted pin connections. The installation remained on the IIT campus for one month, after which the students disassembled it in just 25 minutes. The Chicago Composite Initiative, which provided crucial technical guidance during the project, has since erected FIBERwave PAVILION in one of its classrooms. The fundraising component of the project was as important as its design and fabrication elements. Peluso initially hoped that the carbon fiber industry would donate materials, but "we didn’t have as much luck as we anticipated because we hadn’t done anything before that would warrant their interest," he said. "That’s one of the goals of the pavilion itself, to create an awareness in architecture that this could be a great material to use." Peluso’s course did have help from West System Epoxy, which provided the curing resin at a discount. To fill the funding gap, the students ran a successful Kickstarter campaign, raising $6,937 from a $6,500 goal. They made incentives for the donors, including 3D-printed necklaces and earrings. "I don’t think we realized how much work was going to go into that," said Peluso. To raise additional funds, the class held bake sales on campus. For Peluso, the process of designing and building FIBERwave PAVILION proved as valuable as the finished product. "The way the students collaborated made the project a success," he said. "Sometimes in group projects you get a few drifters, and some really strong ones. But all twelve students really stepped up. This wouldn’t have happened if they hadn’t all come together as a group." Parallel facade systems in contrasting materials mark the edge of development on a reimagined campus. Facade Installer Jangho, Metro Glass Inc. The campus-facing sides of the building feature frit glass curtain walls fabricated by Beijing Jangho Curtain Wall Co. (Jangho) with glass from Xinyi Glass Holdings Limited. “We used the fritted glass to meet the solar performance that we were going for without completely exposing them,” said Carse, who noted that the walls appear nearly transparent at dusk and later, when the interior lights are on. “That’s part of the nature of the building,” he said. “The business school itself has classes going from around 8:30 a.m. until about 10 p.m., so the daily life is not just during the day. The building is really alive during those times and we wanted to make that evident.” During the day, the frit glass facade’s extra-wide mullions maximize the amount of daylight that filters into the offices and classrooms. 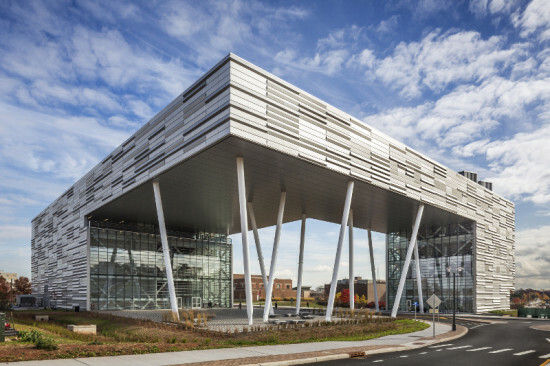 The third component of the Rutgers Business School envelope is a transparent glass curtain wall introduced between the two primary facade systems. Besides serving as an intermediary between the anodized aluminum and frit glass surfaces, the transparent glass elements mark possible points of connection to future buildings as the campus continues to densify. “It allowed us infill,” said Carse. “This project served as a gateway building literally and figuratively,” said Carse. Cars entering campus from Route 18 pass directly through the Rutgers Business School building, its upper stories perched on canted columns. Though designed to indicate the campus’s outside edge—the end of development—the structure’s vital facade simultaneously signals a beginning, a freshly urban approach to campus design within a former suburban stronghold.